Most successful people have been through a lot of challenges and failures in life. Some may have started from the bottom, but now they managed to make their way to the top. It takes a lot of patience, perseverance and self-improvement to support your main driving force, that is passion. For me, passion is the light that helps us find our purpose and guides us towards the journey. Let me share a quick background how Emjae Fotos has transformed so far. Allow me to answer why I blogged, and what keeps me blogging. It was in September 28, 2014 when I purchased the domain name EmjaeFotos.com. Prior to that, I have been blogging for 7 months already under a different name which until now I can’t imagine how I came up with. Honestly, I am so shy to share my blog posts with that name so I started to get insecure and slowly lost interest in blogging. Just when I needed the most, I was invited by the Cebu Blogging Community to attend a blogging summit with other bloggers and aspiring ones. After the inspiring talks and sessions, it was in that event that I decided to finally get a domain name. However, it was not an easy decision to choose a custom name. Do I use my name or create an anonymous brand? It could have been an easy decision to choose an anonymous name. It sounds more professional and I don’t have to post something personal. But after a series of soul-searching, I realized I’ve already been branding the photos I share on Facebook by putting a watermark. So why not use it to brand my photo works? Actually the main reason that I started a website is to create a portfolio of my photos. If you have read about me, I aspire to be a professional photographer. Yeah, that is my dream to make a living out of photography where I could travel places and have freedom of my time. But in most cases, part of reality in photography is that in order to get the big bucks, you got to have the big guns. For a starter, I still lack the gears and high-end equipment to handle big time events. So for now, I use blogging as a platform to hone and improve my skills. In the end, photography is not about the camera but about the shooter. It’s how you put creativity and art into a photograph. Through blogging, I got to practice being creative in sharing photographs. Anyone can take a snap of an event or an adventure but as much as possible, I try to capture more than meets the eye. I look for a different perspective than an ordinary traveler sees. And not only that, blogging has turned me from simply documenting an activity into a storyteller. That’s it! It’s my passion to share the stories I see through my camera that brought me and keeps me into blogging. As I look back to my first ever post, it was the intention to share a social good activity we did that pushed me to blog. I will always look back to this activity when I ask myself why do I blog. Since then, I only took blogging for fun and as a means to share what meets my eye. But now, I believe I have improved myself by surviving the Cebu Blogging Community’s 30-Day Blog Posting Challenge. I have learned a lot of things and was able to appreciate the great opportunities of blogging. With this, I am taking this blog, again, to the next level and pursue to make it a recognized brand. 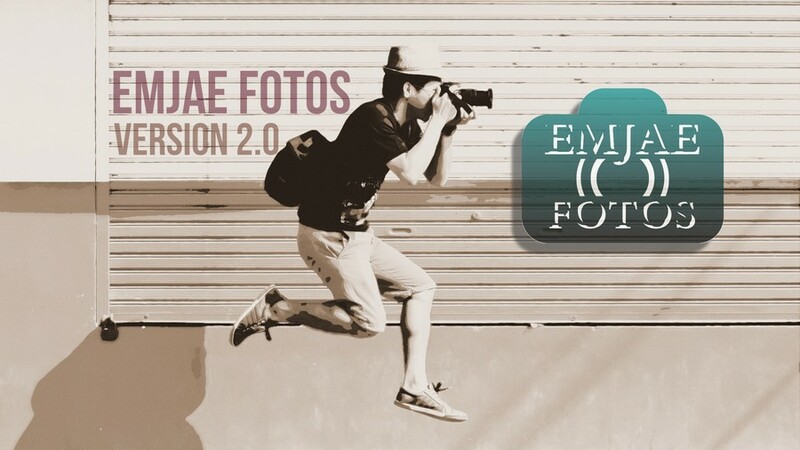 This image below will be my official logo and I call it, Emjae Fotos version 2.0. This is my Day 30 entry for the CBC 30-Day Blog Posting Challenge. I would like to thank the partners: CebuDomain.org, KalamiCebu.com, Zuprome.com, Channelmarie.com, PIA, iNewMedia.org. And to my fellow challengers ChannelMarie.com, ZupRome.com, FueledbyCaffeine.net, WhyCebu.com, and WonderfulCebu.com, please do check their blogs as well. Congrats EMJAE 2.0!!! Your photos are beyond amazing!! I wish I can be as good as you guys. I want to take good photos and don’t even have a good camera. I only have quite a”decent” one which is my smart phone. LOL. I’m sure you’ll be successful in your chosen craft because you’re working hard for it. Cheers!